Scientists Publish Recipe For Making Bird Flu More Contagious : Shots - Health News Researchers ignited a debate three years ago when they changed a deadly flu virus so that it could spread between people. Only five mutations are needed to turn the virus into a pandemic threat. 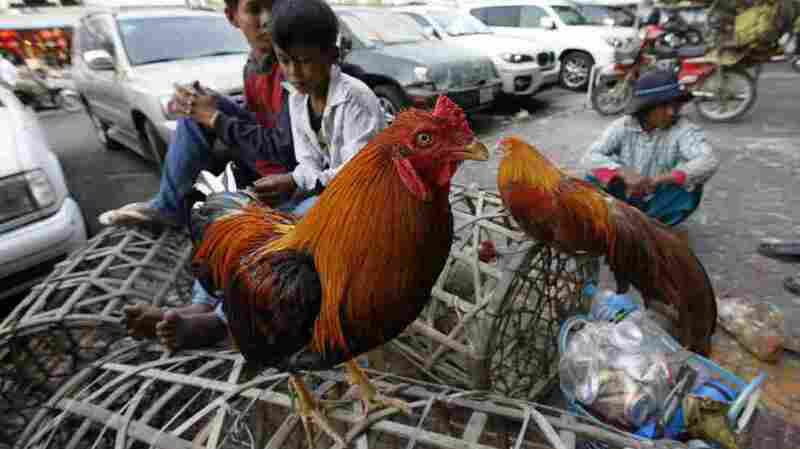 Street vendors sell chickens at a market in Phnom Penh, Cambodia, in early 2013. Last year Cambodia reported more cases of H5N1 bird flu than any other country. The Dutch virologist accused of engineering a dangerous superflu a few years ago is back with more contentious research. In 2011, Ron Fouchier and his team at Erasmus Medical Center took the H5N1 flu virus and made it more contagious. Now the team has published another study with more details on the exact genetic changes needed to do the trick. The H5N1 bird flu is known to have sickened 650 people worldwide, and of those, 386 died. So far the virus hasn't been contagious in people. But Fouchier's work, plus some similar research from another lab, showed for the first time that the virus had the potential to change in a way that would make it a real pandemic threat. Only a few mutations were necessary to make the H5N1 bird flu spread through the air between ferrets, the lab stand-in for people. Critics argued that the scientists had created a dangerous new superflu. And they pushed for the recipe not to be openly published. They feared that others would repeat the work and either not adequately safeguard the virus or would deliberately release it. After a long debate about security versus scientific openness, the research findings did finally appear in a journal. Now, in the journal Cell, Fouchier and his colleagues expand on that initial work. They identified five mutations that are sufficient to make H5N1 spread through the air between ferrets. "Two mutations enable improved binding of the H5N1 bird flu virus to cells in the upper respiratory tract of mammals," Fouchier told Shots in an email. "Another mutation increases the stability of the virus. The two remaining mutations enable the virus to replicate more efficiently." These findings are important for keeping one step ahead of the virus , Fouchier thinks, and for helping to prepare for a possible pandemic. "If we increase our understanding of how influenza viruses become airborne between mammals, we may be able to identify at some point which viruses [out of many that are circulating in nature], we need to keep an eye on because of public health risks," he added. It's still unknown how deadly these engineered viruses would be in people. Fouchier says his group has lab studies underway to determine the pathogenicity of the virus. Before Fouchier and his colleagues published the current work, it underwent multiple layers of review to assess the level of danger it might pose to the public. The team had to get an export license from the Dutch government that normally applies to technology that can be weaponized. The paper was also reviewed by the U.S. National Institute of Allergy and Infectious Diseases, which funded the research. All that oversight causes delay, Fouchier said. But in the end, flu researchers are still able to do the work they need to do and see it published. "That does not mean that we have reached general consensus about the need to do this type of work, and how to do it safely," Fouchier wrote. "But general consensus will be impossible to reach on any topic. We will keep the dialogues going with everyone, but at the same time need to continue this important line of work." Not everyone agrees with that. "I still don't understand why such a risky approach must be taken," says microbiologist David Relman of Stanford University. "I'm discouraged." Relman served on a government advisory committee that considered whether this research should be openly published. He questions whether these studies really will help give public health officials advance warning of the next emerging flu pandemic. And even if the studies might provide a real benefit, Relman says, we won't see it for some time. "And we have, meanwhile, just bought ourselves even more risk," he says.